I was recently privileged to be invited to speak on the rise of Russian organized crime at the Mob Museum in Las Vegas (I would add that this is an excellent museum, which manages to pull off that difficult trick of being both deeply informative and a great deal of fun). In the process, I inevitably spent some time thinking about the allure of Vegas to the Russians, and this led to a very short op. ed. in Vegas Seven magazine. Since then, I’ve been pondering this more and here are a few thoughts, expanded from that article (and my thanks to Vegas Seven for allowing me to draw on it). Russian organized crime has, after all, been one of the depressing success stories of the modern world and an especially transnational one, at that. When the Soviet Union fell apart, it unleashed this new breed of gangster, combining a toughness learned in the Gulag labor camps with a street-smart entrepreneurialism that made them unparalleled criminal deal-makers. They laundered money for the Italians, traded Afghan heroin for Colombian cocaine, trafficked women into Europe and guns into Africa. In the United States, they established bridgeheads in immigrant hubs like New York’s Brighton Beach and have moved into all kinds of underworld activities, from multi-million dollar Medicare frauds to human smuggling. But beyond dropping wads of their dirty cash in the casinos and bars, where are they in Vegas? There are certainly plenty of Russians there, some resident (if you really care, they are especially in western Vegas, specifically zip code 89134, where they represent 4.87% of the population, compared with the 0.92% national average), many visiting. On a purely subjective level, on my one stroll down the strip and into a few of the glittering mega-casino-resort-mall-extravaganzas I heard a goodly amount of Russian being spoken and there are specialist Russian tour operators bringing the new moneyed classes here. On the other hand, even though — despite the massive strides made in cleaning up the city — organized crime is certainly alive, well and avowedly multi-ethnic in Vegas, I can find very few traces of Russian activity here. Although the FBI has established one of its Eurasian Crime Task Forces in Las Vegas, their main targets seem to be everyone but. Bulgarians defrauding car dealers, Armenians skimming ATMs (and using the city for gang sit-downs), but not Russians. Why not? Answering this question tells us something interesting about the Russian gangsters. First of all, for all their reputation for casual violence, they are actually often quite conservative and appreciate that turf wars are bad for business. They would much rather take over vacant territory or business sectors where they can, cut deals where they can’t. In Vegas, the Russians know they would be coming up against entrenched rivals who wouldn’t surrender their operations without a fight. So, the Russians aren’t trying to take over, just make money out of other criminals, becoming everyone’s best friend and facilitator-for-a-fee. So, they help smuggle in girls and drugs, launder dirty money and generally make themselves useful. Secondly, they learn fast. In 2009, Russia banned gaming throughout the country, outside four specific territories: Primorye (for the Asian market), Kaliningrad (European), Azov-City in Rostov region (Middle East, I’d guess) and Altai (I’m not honestly sure: mountain sport and hunt loving Central Asians?). The result has been an upsurge both in underground casinos (which also led to a notorious intra-silovik conflict around Moscow) and gaming-tourism, as the Russian new rich head everywhere from Macao to Bolivia. However, there are some gangsters willing to bet that the big money will be made in the new generation of casinos being built in these approved gambling regions. So the Russian gangsters are coming to Vegas. Not to try and take over, but to learn. Maybe to pick up some partners, some investors. After all, today’s underworld is a global business, where money and experience — I hate the expression, but even “best practice” — gets traded from gang to gang. 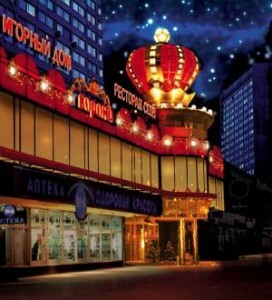 As a result, Vegas’s freewheeling past may yet become Russia’s future. And thanks to Russia’s mobsters and their dirty money, Vegas may be acquiring new competitors, too. I think it’s fair to see that Altai is some way away from becoming a gambling magnet, but there is movement in Primorsky, given the potential market there is from Asian punters. The plan there is undoubtedly ambitious, with 12 casinos to be built by 2016 and then by 2022 in total $2 billion spent building 16 hotels with casinos, a yacht club, malls and the like. We’ll see; so far investment to the tune of $625 million have reportedly been raised. But whether through embezzling the construction budgets (always a great sideline) to laundering money through the casinos (God bless high-turnover cash businesses) to providing additional ‘services’ on the side, it is clear that the Russian underworld is positioning itself to win.